Thalassotherapy offers a range of invigorating, healing and relaxing spa treatments inspired by the sea. France is one of the best places to find a Thalassotherapy centre or ‘Thalasso’ and the seaside resorts of Brittany have a long heritage as spa towns. The fresh sea air, bracing sea and mineral-rich mud and seaweed are all key to providing a full Thalassotherapy experience, designed not only for enhancing beauty, but also to promote healing and wellbeing. 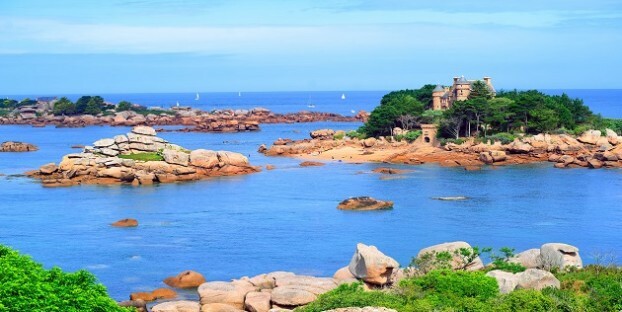 For over 100 years Brittany has been a destination of choice for those seeking the benefits of Thalassotherapy treatment, if you are in need of rejuvenation why not give it a try? You could indulge in hydrotherapy with relaxing jaccuzzi spa baths, a hydro-massage that uses water jets to target muscles and promote good circulation, or take an Affusion shower in a mist of seawater. Agotherapy uses seaweed and marine mud in a variety of wrap treatments and baths – a warm marine mud treatment can ease the symptoms of arthritis while Cryotherapy uses cold seaweed wraps on the legs to improve circulation. Thalassotherapy can also include physiotherapy with some spas offering seawater pools or even exercise classes in the sea itself. Overlooking Sillon Beach this large Thalassotherapy centre has six seawater pools including the amazing ‘Parcours Aquatonic’ which features over 90 water jets, water currents and a Jacuzzi. There is also an ice fountain for those brave enough to try it after a sauna! The perfect choice for nature lovers, Castel Clara offers massages, fitness classes and nature hikes exploring the island as part of your ‘cure’. The restaurant is outstanding too with local seafood a speciality. The hotel juts into the sea and looks like a ship so you’ll feel like you’re on a luxury cruise during your stay! There is a stunning pool and Jacuzzi as well as sea water therapy baths, massage and mindfulness treatments. The restaurant offers a delicious healthy menu including fresh juices and superfoods. This opulent hotel and spa is a real treat to visit. The interiors ooze glamour and sophistication and the range of treatments can be tailored to aid hydration, rejuvenation and weight-loss. The heated outdoor pool, marine pool, Turkish baths and sauna are all exceptional. This state-of-the-art centre offers a full range of Thalassotherapy treatments using seawater, seaweed, marine mud and massage. The spa comes highly recommended and is a favourite with French visitors; usually an excellent sign! This fabulous hotel is just 800m from the centre of Roscoff with a beach on either side and fabulous views over the Isle of Batz. Facilities here include two heated sea-water swimming-pools, a jacuzzi, aquaerobics and a sauna. There’s even a massage area with stunning sea views! Include a spa treatment or spa break in your next Brittany holiday and come home refreshed, relaxed and glowing with health! We have hundreds of self-catering holiday cottages in Brittany ideal for holidays at any time of year. Browse and book with us to get 20% off your Brittany Ferries crossings.